French-Italian engineer who built the Mount Cenis Fréjus Rail Tunnel (1857-70) through the Alps. To accomplish boring the world's first important mountain tunnel, he introduced the first industrial-scale pneumatics for task. [p.351] THE successful construction, by the direction of Napoleon, of a broad and easy highway from Switzerland into Italy, crossing the lofty Alps amid the snows and glaciers of the Simplon, has justly been considered a feat of skill redounding to the glory of its designers. But we have recently witnessed a greater feat of engineering skill, for we have seen the Alps conquered by the stupendous work known as the Mont Cenis Tunnel. This tunnel is 7½ English miles in length; but it is not the mere length which has made the undertaking remarkable. The mountain which is pierced by the tunnel is formed entirely of hard rock, and what added still more to the apparently impracticable character of the proposal when first announced was the circumstance that it was quite impossible to sink vertical shafts, so that the work could not, as in the usual process, be carried on at several points simultaneously, but must necessarily be continued from the two extremities only, a restriction which would occasion a vast loss of time and much expense, to say nothing of the difficulties of ventilating galleries of more than three miles in length. The reader must bear in mind that the importance of this question of ventilation depends not simply on the renewing of the air contaminated by the respiration of the workmen, but on the quick removal of the noxious gases produced in the explosions of the blasting charges. A work surrounded by such difficulties would probably have never been attempted had not Messrs. Sommeiller and Co. invited the attention of engineers to an engine of their invention, worked by compressed air, and capable of automatically working “jumpers” which could penetrate the hardest rock. 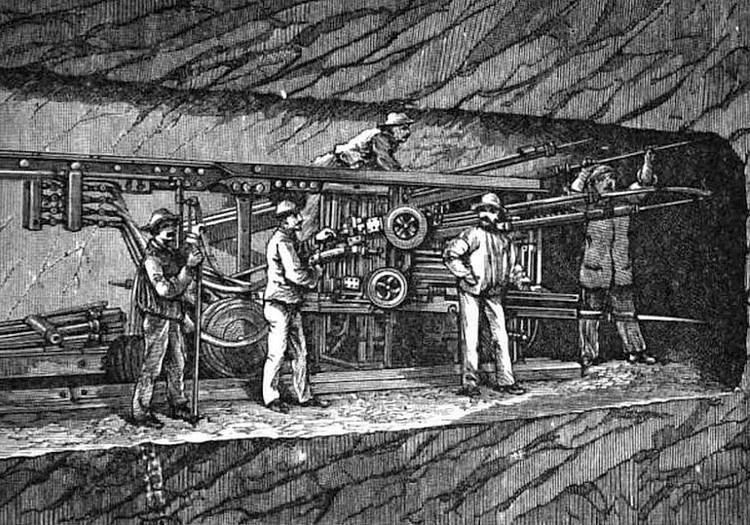 These rock-boring machines, having been examined by competent authorities in the year 1857, were pronounced so efficient that the execution of the long-spoken-of Alpine tunnel was at once resolved upon, and before the close of that year the work had actually been commenced, after a skilful and accurate survey of the proposed locality had been made, and the direction of the tunnel set out. The tunnel does not pass through Mont Cenis, although the post road from St Michel to Susa passes over part of Mont Cenis, which gives its name to the pass. The mountain really pierced by the tunnel is known as the Grand Vallon, and the tunnel passes almost exactly below its summit, but at a depth the perpendicular distance of which is as nearly as possible one mile. The northern end of the tunnel is near a village named Fourneaux. Pending the construction of the Sommeiller machines, and other machinery which was to supply the motive force, the work of excavation was commenced at both ends, in 1857, in the ordinary manner, that is, by hand labour, and in 1858 surveys of the greatest possible accuracy were meanwhile made, in order that the two tunnels might be directed so that they would meet each other in the heart of the mountain. The reader will at once perceive that the smallest error in fixing on the direction of the two straight lines which ought to meet each other would entail very serious [p.352] consequences. The difficulties of doing this may be conceived when we remember that the stations were nearly 8 miles apart, separated by rugged mountains, in a region of snows, mists, clouds, and winds, over which the levels had to be taken, and a very precise triangulation effected. So successfully were these difficulties overcome, and so accurately were the measurements and calculations made, that the junction of the centre lines of the completed tunnel failed by only a few inches, a length utterly insignicant under the conditions. The work was carried on by manual labour only, until the beginning of 1861, for it was found, on practically testing the machinery, that many important modifications had to be made before it could be successfully employed in the great work for which it was designed. 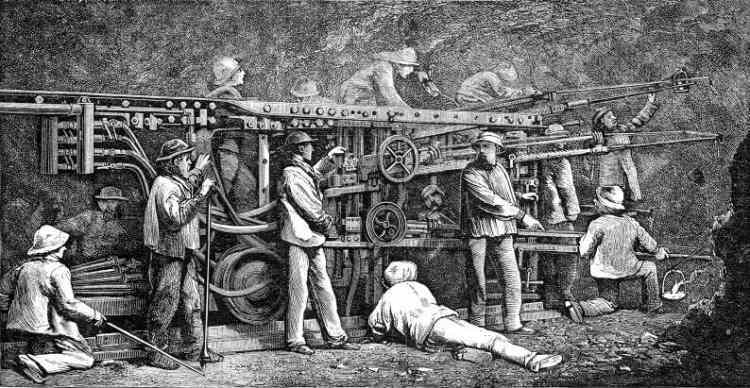 After the machinery had been set to work, at the Bardonnêche end, breakages and imperfections of various parts of the apparatus, or the contrivances for driving it, caused delay and trouble, so that during the whole of 1861 the machines were in actual operation for only 209 days, and the progress made averaged only 18 in. per day, an advance much less than could have been effected by manual labour. The engineers, not disheartened or deterred by these difficulties and disappointments, encountered them by making improvement after improvement in the machinery as experience accumulated, so that a wonderful difference in the rate of progress showed itself in 1862, when the working days numbered 325, and the average rate of advance was three feet nine inches per day. At the Fourneaux extremity more time was required for the preparation of the air-compressing machinery, and the machines had been at work in the other extremity, with more or less interruption, for nearly two years before the preparations at Fourneaux were completed. The illustration…, Fig. 178, represents the Sommeiller machines at work, the motive power being compressed air, conveyed by tubes from receivers, into which it is forced until the pressure becomes equal to that of six atmospheres, or 90 lbs. per square inch. The compression was effected by taking advantage of the natural heads of water, which were made to act directly in compressing the air; the pressure due to a column of water 160 ft. high being made to act upwards, to compress air, and force it through valves into the receivers; then the supply of water was cut off, and that which had risen up into the vessel previously containing air was allowed to flow out, drawing in after it through another valve a fresh supply of air; and then the operations were repeated by the water being again permitted to compress the air, and so on, the whole of the movements being performed by the machinery itself. The compressed air, after doing its work in the cylinders of the boring tools, escaped into the atmosphere, and in its outrush became greatly cooled, a circumstance of the greatest possible advantage to the workmen, for otherwise, from the internal warmth of the earth, and that produced by the burning of lights, explosions of gunpowder, and respiration, the heat would have been intolerable. At the same time, the escaping air afforded a perfect ventilation of the workings while the machines were in action. At other times, as after the explosion of the charges, it was found desirable to allow a jet of air to stream out, in order that the smoke and carbonic acid gas should be quickly cleared away. Even had the work been done by manual labour alone, a plentiful supply of compressed air would have been required merely for ventilation, so that there was manifest advantage in utilizing it as the motive power of the machines. [p.354]The tunnel is lined with excellent brick and stone arching, and it is connected with the railways on either side by inclined lines, which are in part tunnelled out of the mountain, so that the extremities of the tunnel referred to above are not really entered by the trains at all; but these lateral tunnels join the other and increase the total distance traversed underground to very nearly 8 miles, or more accurately, 7.9806 miles. The time required by a train to pass from one side to the other is about 25 minutes. What a contrast is this to the old transit over the Mont Cenis pass by “diligence”! We have the scene depicted in Fig. 179, where we perceive, sliding down or toiling up the steep zigzag ascents, a series of curious vehicles drawn by horses with perpetually jingling bells. The cost of the Mont Cenis Tunnel was about £3,000,000 sterling, or upwards of £200 per yard; but as a result of the experience gained in this gigantic work, engineers consider that a similar undertaking could now be carried out for half this cost. It is supposed that the profit to the contractors for the Mont Cenis Tunnel was not much less than £100 per yard. The greatest number of men directly employed on the tunnel at one time was 4,000, and the total horse-power of the machinery amounted to 860. From 1857 to 1860, by hand labour alone, 1,646 metres were excavated; from 1861 to 1870 the remaining 10,587 metres were completed by the machines. The most rapid progress made was in May, 1865, in which month the tunnel was driven forward at one end the length of 400 feet. When the workings were being carried through quartz, a very hard rock, the speed was greatly reduced—as, for example, during the month of April, 1866, when the machines could not accomplish more than 35 ft. The perforators used in the Mont Cenis Tunnel were worked by compressed air, conveyed to a small cylinder, in which it works a piston, to the rod of which the jumper is directly attached. The air, being admitted behind the piston, impels the jumper against the rock, and the tool is then immediately brought back by the opening of a valve, which admits compressed air in front of the piston, at the same time that the air which has driven it forward is allowed to escape, communication with the reservoir of compressed air having previously been closed behind it. The whole of these movements are automatic, and they are effected in the most rapid manner, four or five blows being struck in every second, or between two and three hundred in one minute. Water was constantly forced into the holes, so as to remove the débris as quickly as it was formed. A number of these machines were mounted on one frame, supported on wheels, running on the tramway which was laid along the gallery. The perforators had no connection with each other, for each one had its own tube for the conveyance of compressed air, and its own tube to carry the water used for clearing out the hole, and the cylinders were so fixed on the frames that the jumpers could be directed in any desired manner against any selected portion of the rock. They were driven to an average depth of about 2½ ft, and the process occupied from forty to fifty minutes. When a set of holes had thus been formed, the cylinders were shifted and another series commenced, until about eighty holes had been bored, the formation of the whole number occupying about six or seven hours, and the holes being so arranged that the next operation would detach the rock to the required extent. The flexible tubes, which conveyed the air and water to the machines from the entrances, were then removed from the machines and stowed away, the frame bearing the perforators was drawn back along the tramway, workmen advanced whose duty it was to wipe out the holes, [p.355] charge them with powder, and fix the fuses ready for the explosion. When the slow-burning match was ignited, all retired behind strong wooden barricades, at a safe distance, until the explosion had taken place; and after the compressed air had been allowed to stream into the working, so as to clear away all the smoke and gas generated by the explosion, the workmen ran up on a special tramway the waggons which were to carry away all the detached stones; and when this had been done, the floor was levelled, the tramways were lengthened, and the frame bearing the drilling machines was brought up to begin a fresh series of operations, which were usually repeated about twice in the course of every twenty-four hours. A great part of the rock consists of very hard calcareous schist, interspersed with veins of quartz, one of the hardest of all rocks, which severely tries the temper of the steel tools, for a few blows on quartz will not unfrequently cause the point of a jumper to snap off. 15 Mar - short biography, births, deaths and events on date of Sommeiller's birth. Surveying the Mont Cenis Tunnel - How can tunnels meet when bored from two sides of a mountain? From Our Iron Roads (1883). The Mont Cenis Tunnel - Chapter from Underground, or Life Below the Surface (1876). The Mont Cenis Tunnel Chapter from Underground, or Life Below the Surface (1876). 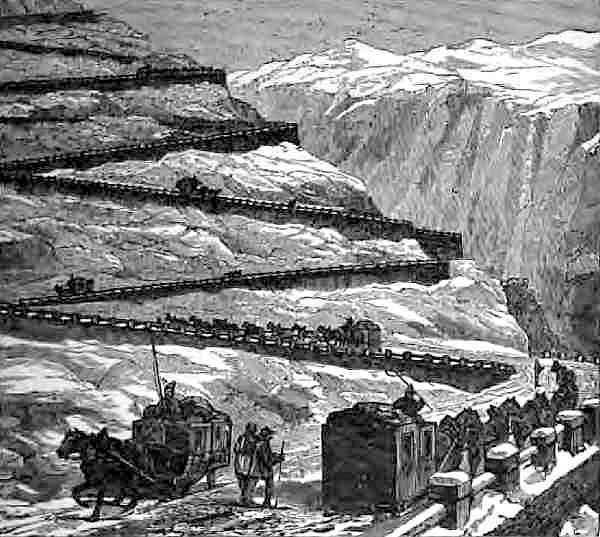 Today in Science History event description for the opening of the railway through the Mont Cenis tunnel on 19 Sep 1871.